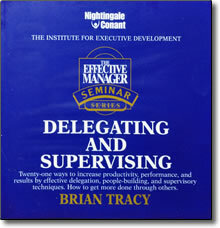 Delegating and Supervising DVD by Brian Tracy – Discount! 21 ways to increase productivity, performance, and results by effective delegation, people-building, and supervisory techniques. How to get more done through others. If you can delegate and supervise employees effectively, you can be among the most productive managers in any organization. Stop spending any of your valuable time on anything that can be delegated to others. Let Brian Tracy show you how today!